I love to write about comparison of different dog breeds. It is not because that I like to compare things a lot (may be it is to some degree), it is because that, by comparison, it can make me more throughly understand all the subjects involved in the comparison. Today, I am going to talk about the differences and similarities between Havanese and Yorkshire Terrier, also know as Yorkie. (I love the name Yorkie more as it simply sounds cuter so I will use that in the remaining of the blog post.) This can be a very interesting and important subject for those of you who are potential Havanese future owner and still trying to choose between Havanese and Yorkie. Let’s now look more deeply at the small and cute dogs. If you are trying to choose between Havanese and Yorkie, there is a good chance that you are especially attracted to small dogs. While both of them are considered as small dogs, they don’t exactly share the same size. 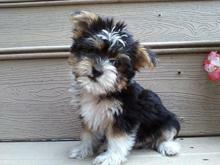 A Havanese adult usually weights around 13 pounds while a Yorkie adult weights only around 7 pounds. Havanese generally doubles the weight of Yorkie which is difficult to imagine consider the already very small size of Havanese. In terms of the height, the difference isn’t as huge. A Havanese is around 11 inch tall while a Yorkie is around 9 inch tall. Still, due the large difference in weight, Yorkie do look obviously smaller than Havanese. Havanese has above average energy level. They are considered to be quite energetic especially when you compare with other small dog breeds like Yorkie. There are of course good things and bad things that come with the high energy, mostly good in my opinion, but can be bad for those potential owners who don’t process a lot of energy themselves. The good part is that they are almost always looking cheerful and they do need to exercise which also force you to do exercise with them. Roughly speaking, you should have a roughly 45-minute walk with your Havanese daily. To make your Havanese even happier, you should also have a 2-hour hiking session with him every week or at least every month. You will surely know when your Havanese needs some extra exercise or playtime. He would simply mess up your home seriously when he has too much energy left over. The bad part is that if you just hate to exercise, you will have a hard time swallowing the amount of energy you have to spend with all those walking and hiking. For those of you who don’t have high level of energy, may be a Yorkie is more suitable to you. You may probably just need to take a short 20-minute walk with your Yorkie. They also don’t mess up your home as much as their energy level is not nearly as high as the Havanese. Therefore, it really depends on whether you are a high-energy person or a low-energy person to really say which breed is more suitable to you. Don’t be fooled by the super small size and the super cute face of the Yorkie, they are more aggressive the the Havanese. It is oftentimes that we confuse the size with the aggressiveness of a dog breed. We also easily confuse aggressiveness with the power a dog breed has. Yorkie aren’t strong and they are tiny but they are aggressive. Do you have a friend that is shorter than most others but have a very aggressive nature? He probably can’t beat a six feet guy but the aggressiveness and danger should not be completely ignored. Due the aggressive nature of the Yorkie, they are not as kids-friendly as you may want them to be. It’s not that you can’t train them to be nice to your kids. I am just saying that Yorkie naturally are slightly aggressive and you need to provide them with training in order to make things work if you have kids in the house. On the other hand, most Havanese are very friendly to kids and of course kids usually love them back too. If you have kids and you like Yorkie’s look and Havanese’s almost equally, the friendly nature of the Havanese may make it a better choice for you to own. Both Havanese and Yorkie are smart and considered to have above average intelligence among all dog breeds. They are both smart enough to be trained to be watchdogs and you can’t say the same to every dog. It is often fun to be around smart dogs because you can easily train them to do some basic actions and tricks. Since Havanese are generally very friendless and not aggressive, if you are not an ambitious dog owner, you don’t really have to spend a lot of effort to give them a lot of training except of potty training. On the other hand, since Yorkie can be aggressive, you have to be more strict from day one. For example, you don’t want to allow them to enter your kitchen when cooking and you don’t allow them to be aggressive to your kids. You have to make it clear from day one that these actions are not allowed and make it very clear that you are the boss in the home. If you are not strict and just let them do whatever they want, they will very soon think that they are the boss and they can mess up your home wildly anytime. In conclusion, if you are trying to choose between owning a Havanese and a Yorkie, the first thing to consider is their friendliness. If you have kids, Havanese is the better choice. If you don’t, both are good choices although you will have to spend more time with your Yorkie on not being too aggressive.